A president is a leader of an organization, company, community, club, trade union, university, nation, a division or part of any of these, or, more generally, anything else. Etymologically, a president is one who presides (from Latin prae- "before" + sedere "to sit"; giving the term praeses). Originally, the term referred to the presiding officer of a ceremony or meeting (i.e., chairman), but today it most commonly refers to an executive official. Gracie Allen, in How to Become President (1940), Ch. 2 : Others make good, why not you? Let us not be mistaken: the best government in the world, the best parliament and the best president, cannot achieve much on their own. And it would be wrong to expect a general remedy from them alone. Freedom and democracy include participation and therefore responsibility from us all. Václav Havel, in an address to the Institute of Contemporary Arts, London, as quoted in The Independent, London (24 March 1990), referring to his work as an absurdist playwright. There used to be a time when this country's president could have delivered the same New Year's Address he had given a year before, and nobody would have noticed. Fortunately, that time has passed. Bush is now undermining the United Nations. He is acting outside it, not withstanding the fact that the United Nations was the idea of President Roosevelt and Winston Churchill. Both Bush, as well as Tony Blair, are undermining an idea which was sponsored by their predecessors. 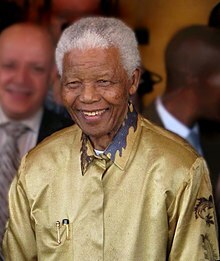 Nelson Mandela, in a speech at the International Women's Forum in Johannesburg, South Africa (29 January 2003), prior to the 2003 invasion of Iraq. The most thoroughly and relentlessly Damned, banned, excluded, condemned, forbidden, ostracized, ignored, suppressed, repressed, robbed, brutalized and defamed of all Damned things is the individual human being. The social engineers, statisticians, psychologists, sociologists, market researchers, landlords, bureaucrats, captains of industry, bankers, governors, commissars, kings and presidents are perpetually forcing this Damned Thing into carefully prepared blueprints and perpetually irritated that the Damned Thing will not fit into the slot assigned to it. The theologians call it a sinner and tries to reform it. The governor calls it a criminal and tries to punish it. The psychotherapist calls it neurotic and tries to cure it. Still, the Damned Thing will not fit into their slots.